The wait is over! Fans both new and pro can now clash in the ultimate brawl between gaming legends. Get ready to play the biggest game in the Super Smash Bros.™ series ever—anytime, anywhere. In the Super Smash Bros. 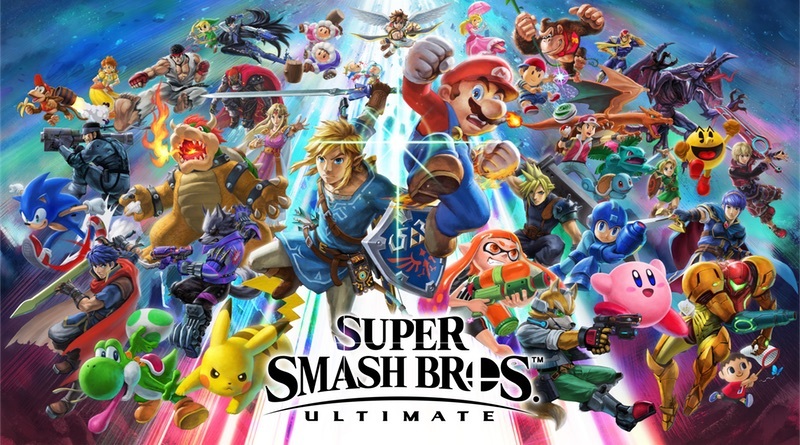 Ultimate game, newcomers like Inkling, Simon Belmont, King K. Rool, Ridley, Incineroar, and Isabelle join every fighter from past Super Smash Bros. games. A total of 74 fighters from over 30 games series are here to battle it out. All past Super Smash Bros. fighters have joined the battle. Everyone is here! More than 100 stages. The new Stage Morph option even transforms one stage into another while battling. Play in a variety of ways. Go 1-on-1 with a friend, hold a 4-player* free-for-all, kick it up to 8-player* battles and more. Whether you’re throwing a party or a tournament, a wide range of modes and options await you. New items, Assist Trophies, and Pokémon spice up battles with special abilities and unpredictable results. Unleash the power of Spirits. Collect characters from a wide range of video game worlds to power up your fighters in different ways. Test out tons of combinations! Explore the single-player Adventure Mode, World of Light. Fighters and spirits will have to team up to stop the mysterious fiend known as Galeem. More than 800 music tracks can be listened to with the in-game music player (even when the system’s screen is off!). Play with a wide variety of control options, including GameCube™ Controllers. Buy early, get Piranha Plant for free! 2) Buy the retail version and register the game card with My Nintendo before 11:59 PM PT on Jan. 31, 2019. If you would like to purchase the game please visit https://www.smashbros.com/. * Additional accessories may be required for multiplayer mode; sold separately. ** A software update may be required to receive the downloadable content. Download code expires 6/30/2019 at 11:59 p.m. PT. Full version of game required to use DLC.